One thing that my experience in teaching has taught me is to adapt quickly and respond to new situations! Below I have tried to summarise some of the typical tasks in my role, and how a career in teaching is so much more than you might, at first, think. Because teachers have the ability to spot potential and nurture talent…. UCAS Teacher Training Applications opened last Tuesday, 27th October, so recently I have been involved in discussions around student admissions and interviews. Depending on the training route you choose, you are either interviewed at the University or at one of our partner schools. This means that I have been coordinating the sharing of key guidance and interviewing best practice to spot the next generation of outstanding teachers who want to train with the University of Leeds. Because teachers know how to reach out to and engage their audience…. 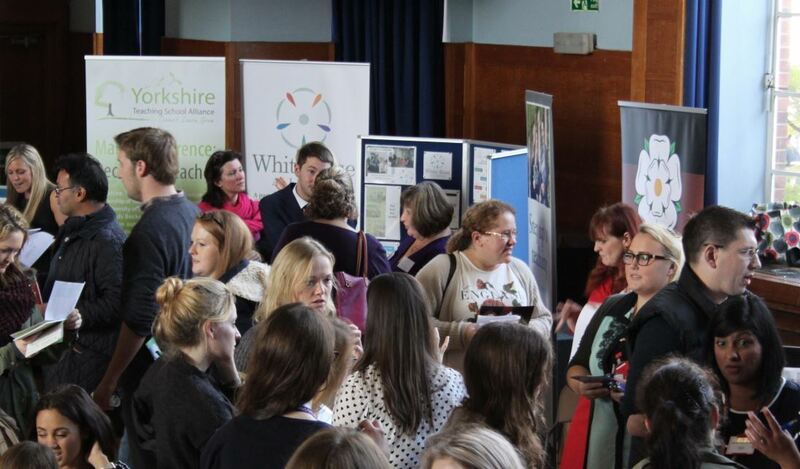 With the lead up to applications opening on 27th, I have recently been speaking to prospective trainees at local University Careers’ Fairs, and more specific careers events for working in Education. When speaking to someone at a recruitment event I have to quickly assess their current understanding around the teacher training process and guide them in their career decisions, much like a teacher in the classroom helps their pupils progress. Because teachers are professionals that can operate across a variety of settings…. As Partnership Manager I get to work with a lot of schools in different contexts and settings. I would always advise anyone who’s thinking about becoming a teacher to try to get as much experience as possible in different schools– both Primary and Secondary. Every school is different; in different locations, serving different demographics and with a different ethos. It’s important to make an informed decision when choosing teaching as a career. Because teachers are master planners and organisers…. At a more strategic level, I have spent time working on our long-term plan for the Teacher Education Partnership. At work, I am constantly thinking at least one year ahead, so sometimes it’s easy to get confused as to whether it’s 2015 or 2016 yet! In order to be successful in teaching, you need to be able to plan both in the short, medium and long term and respond to the needs of the individual’s in your classes. Because teachers need to make sure that what they teach is correct, relevant and engaging…. As a team, we are constantly reviewing and updating the PGCE programmes that we offer to make sure they meet government requirements and provide the best possible experience for trainees. The School of Education also offers progression to our Masters’ programmes. We look for trainees who have the potential to become outstanding teachers and continue with their commitment to professional development in Education. Because teaching is about so much more than just your subject…. Finally, I have recently taken on the additional role of Disability Contact for the School of Education – a chance for me to have more face-to-face contact with current students. It’s important to remember the pastoral element to a career in teaching. Often prospective trainees are so engrossed in thinking about how to teach their subject, they forget about all of the other aspects involved in working with young people. There are many social and economic factors in education that you will have a role in addressing as a teacher. That is why I would recommend a career in teaching to anyone: You never stop learning when you’re teaching. You can combine the professional workplace with continued academic research and have a measurable impact on young people’s lives.